A Day’s Work in the City by One of the Underpaid. No. III. — 11 o’clock. Capel Court and the Stock Exchange. William S. Brunton (fl. 1859-71), artist. Fun (15 August 1868): 242. Signed with a monogram lower left. Engraved by the Dalziels. Courtesy of the Suzy Covey Comic Book Collection in the George A. Smathers Libraries, University of Florida. All emphases in original but paragraphing added for easier reading. Click on image to enlarge it. It's quite likely that a good many serious people — who, mind you, are about as keen hands at a bargain as anybody I know — it’s quite likely, I say, that if they were to take a moral walk about London City they would talk about the frivolity and thoughtlessness of the passengers by the river steamboats, and would speak of the Stock Exchange as the Temple of Mammon — but there, if I go on and on and on like this I shan’t get to Capel Court till 11.l5, and then there’ll be a wigging from the Governor, who’s pretty certain to be waiting on the step of “the house” at 11 precisely. Temple of Mammon indeed! Change the M to a G - and there you have it. Why, to begin with, the mystery that’s made of the place itself (not much of a place, either, with its dingy pillars and grimy walls, and its ugly domes that are only equalled by South Kensington), as though it is a kind of palace instead of being more like a coach factory turned into a seed market than anything else! Of course, it’s the “operations” that are the mystery, and very nice operations some of 'em are. Surgical ones are nothing to 'em, not half so dangerous, so deadly, nor so uncertain; and as to medical jargon that we’ve all heard so much about. I’ll back the slang of finance, the jargon of the City, against anything I know. You’ve only to read the City Article and the Markets to find that out, and the man that has mastered the meaning of “Contangos” and can talk about “prefs” and all the rest of it, may hold his tongue about other people's nonsense. Perhaps as a mere show the Stock Exchange is about as lively an exhibition as anything in the City can be — and that’s not saying much, for we’re deadly dull in the City. 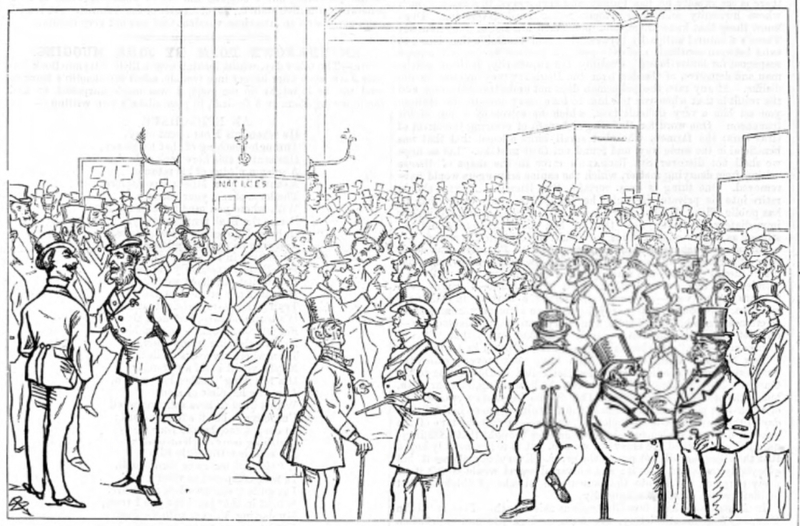 At all events, it begins lively enough at 11 o’clock, when the beadle suddenly leaps up in a pulpit, like a magnified Jack-in-tho-Box, and begins to spring a diabolical rattle as though he was the raving mad mechanical apparition of a departed watchman. They begin business with a rattle, and they keep it up much the same way pretty often. There’s a good deal more cry than wool, I can tell you, and if you want anything promoted that's the place to go to. Not but what there are promoters to be found outside. Why, I've known men — some of those I’ve spoken of already — whose names were good for anything they liked to name, but who broke down in that merry go-round of a game by backing the wrong card and meaning to win all the time, — I’ve known men, I say, who used to lurk about Capel Court, and dine off a biscuit and cheese that they took out of their hat, and half-a-pint of warm porter at the “tap” under the old Auction Mart, — that would have sworn by all they held sacred (and that wasn’t much) to make your fortune for fifty shillings by an investment that they alone knew of, and would have undertaken to get up a company and bring the 50,000 ten-pound shares to ninety premium, if anybody could only be induced to advance the necessary five-and-twenty pounds to take an office and pay for the printing of a prospectus. This they’d unfold to anybody who’d listen to ’em and stand a pint, poor old chaps; and years before they’d drank champagne out of silver cups, and gone down to Epsom in their own drags. This is what the Stock Exchange had done for them; and this is what it might have done for me if I’d let it — or, at least, if I’d had any more money. Don’t I wish I had a little now? I think I should know where to place it: — for after all, we chaps don’t go about the City for nothing, and then you’re not always bound to lose, even in Capol Court.